I am by no means a chicken expert, chicken whisperer or chicken guru. Given my former City Girl status, I am not doing things, “the way they’ve always been done.” I like to think that through my research and with my enthusiasm, I breathe new life into the process and shake things up a bit. I love keeping chickens. I love their eggs, I love their antics, and I love that we are teaching our kids some really important things along the way like responsibility, generosity and gratitude. We have 14 chickens and they are completely free range, meaning they come and go as they please. They have a cozy little chicken coop (previously used for a different purpose) that they sleep in at night or hang out in any time they want. It’s not as cute as I’d like it to be, but it’s insulated and well-built, so the decorating can come later. Also, we can see it from our kitchen window, which makes it easy to keep an eye on the girls. 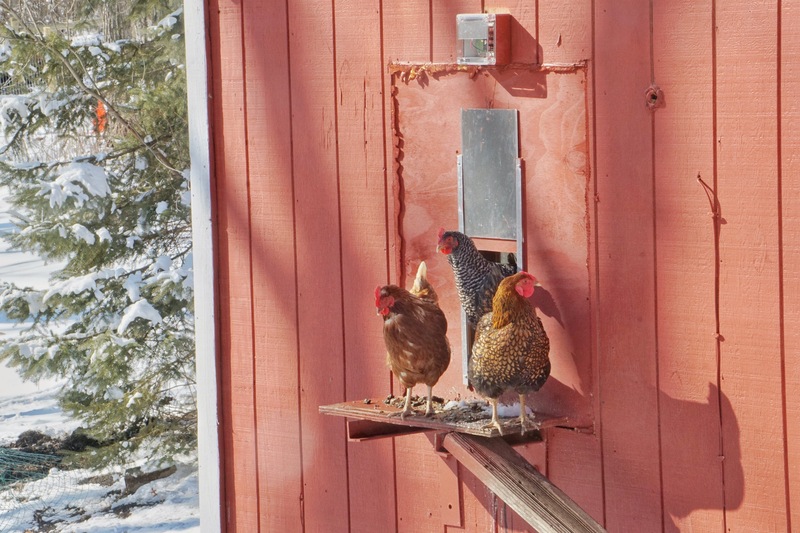 There are a few things that make keeping chickens much much easier. I like to think of these as, City Girl Hacks. The first is an automatic door which opens and closes based on the sun. This is genius folks, pure genius. And it actually works! Every.Single.Time. Two more City Girl Hacks are an automatic watering system (which we mounted to a small tank) and an automatic feeder. The feeder holds one 40lb bag of feed. It works like a charm, and keeps their food completely clean. Depending on the season, and how many bugs the girls find, we fill it about every 2-4 weeks. The watering system insures they have access to fresh, clean water at all times and eliminates the possibility of contamination. We know that what the chickens eat has a direct impact on the quality of the eggs they produce. Since we eat their eggs, it directly affects our diet as well. We choose to feed them Scratch and Peck Feeds, Naturally Free Layer Feed. It is very high quality and the chickens love it. If we need it in larger quantities we purchase it from Azure Standard, a more cost-effective option. Our chickens also have access to grit to aid in digestion, and a very small amount of ground up corn in the winter to help keep them warm. Occasionally, we spread a big ‘ole pile of compost for them to scratch around in. They go nuts! A lot of the things I’ve learned about keeping chickens have come from a really knowledgeable chicken rancher, named Lisa, of Fresh Eggs Daily. She’s an invaluable resource for anyone raising chickens. Her blog taught me about putting apple cider vinegar in their water, along with probiotics and garlic in their food. My favorite thing I’ve learned from her is about adding Coop Confetti™ (a blend of dried herbs) to our chicken’s nesting boxes. If only you could smell it through the screen! It’s heavenly! It makes the whole coop smell like a garden, and that’s quite a feat for a chicken coop. It’s also specially formulated to be beneficial for the chickens too, an added bonus. I am working on implementing a more holistic approach to chicken keeping, little by little, with resources I’ve found on Lisa’s blog. In addition to the logistics of keeping chickens, it is important to talk about the impact that the chickens have on our lives. Our chickens roam about freely and that provides us with plenty of opportunities to interact with them. Feeding, watering, and collecting eggs helps our son learn responsibility and about caring for something other than himself. He also learns about gratitude for where our food comes from. While petting a friendly chicken in the yard we talk about things like being gentle with the chickens, and thanking them for making the eggs we eat for breakfast. We also talk about generosity as we give others eggs during the warmer months when the chickens produce more than we are able to use ourselves. Caring for animals played an important role in my husband’s childhood, and taught him many valuable life lessons. I am grateful that we have the opportunity to teach our children in a similar way, and I am learning right along with them. Do you have any tips or tricks for holistic chicken keeping? What lessons do you teach your children through raising animals? What lessons have you learned yourself? Next postWelcome Friends of Fresh Eggs Daily! I learned that you should NOT put a plastic iguana inside a chicken coop… they get scared and won’t lay 😳 just ask Denise! Oh my goodness! That’s hilarious, and good advice too! Great article! Thanks for the shout out. Thank you so much, Lisa. I am so grateful for all of your resources! Enjoyed your read. Reminded me of how my Momma did it. My childhood with Momma’s chickens, hearing her talk to them and them talk back was so soothing to me. Seeing the chickens always around, watching Momma AND Daddy go after predators in their old chicken coop that were after the hens. We all recognized the loud squaking and would be there quick. Thank you so much, Reba! I hope someday my kids will have similarly fond memories to look back on! Thanks for reading! Oof. Lots of advertisements in there. If your chickens are free range you don’t need to give them grit, in fact if they mistake it for food it can cause them to not eat real food and “fill up” on grit. Grit serves a purpose in digestion. It sits in the gizzard (a strong muscular pouch) and grinds up food before it goes to the stomach because chickens do not have teeth. In order to grind up the food they need small rocks. But truly free-range chickens, and even chickens with large pen access, don’t need additional grit because they ave access to ground. They will find small rocks and pebbles and sand to ingest as needed to use as grit, just digging in your lawn. There’s lots of those around. If they mistake the grit you put sown as something to eat, they could end up putting so many rocks in their crops/gizzards that they don’t eat their normal food or forage. Thanks for the feedback. As a former City Girl, I’m learning every day!